I am doing super great on my goals. My daughter gets married in a little over 2 weeks and I want to make sure I look and feel good for the event. But man I do love carbs. Carbs don't love me. I eat healthy carbs like fruit and beans, but grain and I have to break up anytime I am trying to tone up. 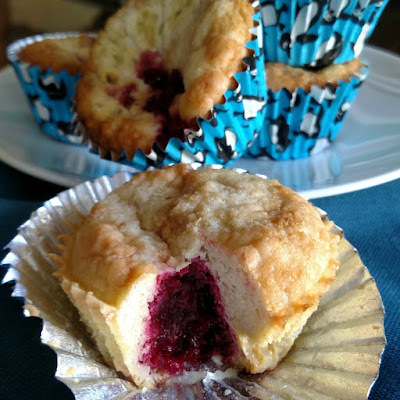 I got some gorgeous cranberries in my CSA Organic box, so I decided to use them in a healthy muffin I could reach for when a carb craving comes along. Cranberries are misunderstood. People overlook them and reach for traditional berries, when the truth is, they are just as good! I love the tangy tartness it brings to these muffins that are low carb high protein and gluten-free. Enjoy my healthy friends. Nothing better than muffins! 60 drops liquid stevia drops or sweet drops (vanilla creme is the best) You can insert maple syrup, orange juice, applesauce or any other sweetener alternative here. 2 cups cranberries, rinsed and chopped. In large bowl, mix eggs, butter, coconut milk, stevia and salt. In smaller bowl, combine sifted coconut flour and baking powder. Add dry mix into batter, blending thoroughly until there are no lumps. Pour batter into greased muffin tins. Mix cranberries and sweetener of choice together in a sauce pan and stir over low heat until bubbly. place a TBSP of the cranberry in the middle of each muffin batter in filling dividing into 12 muffins and bake at 400 degrees F for about 15 minutes. Enjoy!